Please join me in welcoming author Khara Campbell to Conversations today! 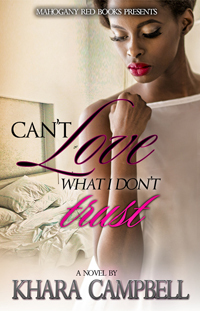 Khara is here to talk about her new release, Can't Love What I Don't Trust! So, check out the cover and blurb below. And don't forget to check out her bio too, and get to know Khara! Cassandra had been in love before and if you asked her, love was pain; every day she was reminded of that with the hand she was currently dealt. She struggles to provide for the kids, working a dead-end job while going to school. Stuck in a meaningless relationship, which only involved midnight creeps into her bed, she ends things with Darius in hopes for something better in life. Just when Cassandra isn't looking for anything or anyone, that's when Marco comes along; he's handsome, a great father to his son, and a business owner. Marco's had his share of women and often juggled relationships, but upon meeting Cassandra, his desire is kindled and he has to fight against wanting anything more than just a casual thing. With each day, they both fight the obvious; they want each other. A night of forbidden passion leads them into bed together; they soon wind up going back and forth, as Cassandra begins to date Damian to distract her from the one she really wants--Marco. The attraction is strong and the chemistry is explosive--will their efforts to ignore their hearts' desire trump love, or will they finally give in to what is obviously meant to be? Khara Campbell holds a Bachelors of Fine Arts Degree in Creative Writing from Midland Lutheran University. She enjoys blogging about the happenings of life, faith, parenting, her publishing journey, marriage, fashion, and her Bahamian heritage on www.kharacampbell.blogspot.com. She was born and raised in Nassau, The Bahamas. She resides in the Washington, DC metro area with her husband and their three young children. Khara is a contributor to www.theprayingwoman.com, www.blackliteraturemagazine.net and www.theliterarynetwork.com. She wrote an essay for Ebony Magazine and she was also featured in Bronze Magazine and the Tribune Newspaper in Nassau, The Bahamas.